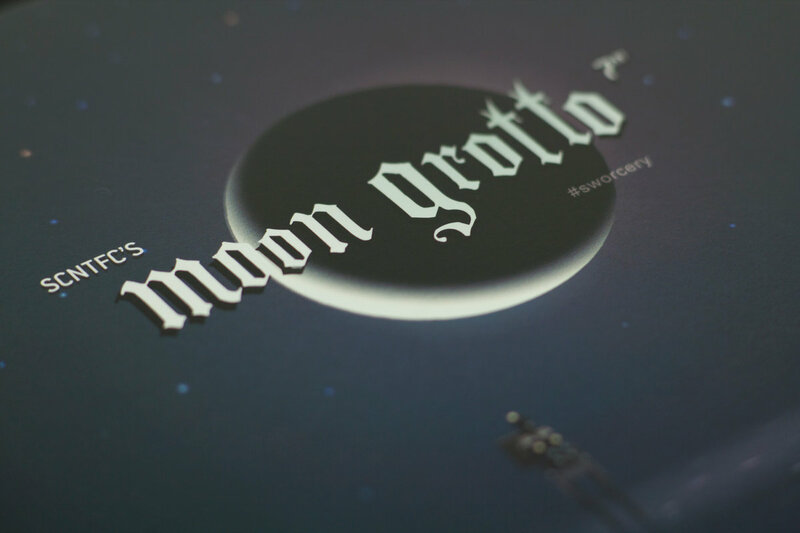 By far the most elaborate of the backer rewards for the Venus Patrol Kickstarter, the Moon Grotto 7″ was the final and physical manifestation of my minor contribution to Superbrothers: Sword & Sworcery EP, the mobile and PC game from Superbrothers, Capy & musician Jim Guthrie. Following on the work we did creating the quasi-alternate-reality-game mystery that ran beneath #sworcery itself (which you can read more about here), sound designer and musician SCNTFC encapsulated said mystery into a four-minute track, backed with a remix of Guthrie’s ‘Ballad of the Space Babies’ on the flip side. What only a handful of very, very dedicated #sworcery players ever realized was that the 7″ itself was a key to unlock a door leading down even further into the game’s depths, filled with audio/visual clues scattered around the record packaging. Where exactly does all this lead? Somewhere deep into the future, probably, along with all your cosmic friends. Now thoroughly sold out, you can still get a digital version of the record direct from SCNTFC, along with bonus mystery audio not available elsewhere.